In Sept.'08, in the midst of writing "The Awakening of Darcy and Elizabeth", I did a marvelous Jane Austen day tour of Hampshire with Hidden Britain tours. See also my other galleries here of many Pride and Prejudice film settings, including Chatsworth. 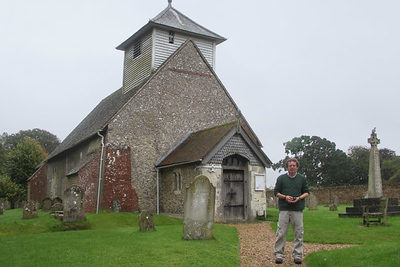 My first stop with Phil of Hidden Britain Tours from Bolingbroke, Hampshire was Dummer Church in Dummer Village. Austen visited the Terry family in Dummer (and frequently danced with their son, Stephen), and may have attended the church there.